Artistic rendition of Pakistan's PakTES-1A satellite. 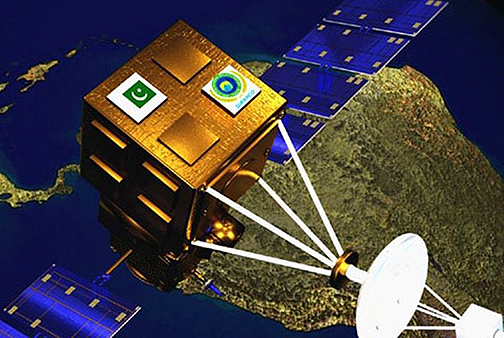 Pakistan will be launching PakTES-1A, a remote sensing satellite (RSS), in July of this year, according to a Foreign Office spokesperson, Dr. Muhammad Faisal, who indicated such would occur in his social media post. According to Dr. Faisal, PakTES-1A, which is an indigenously developed satellite, weighs 285 kg. and will be launched to a 610 km sun-synchronous orbit next month. Earlier this year, Beijing had announced that China would launch two remote sensing satellites for Pakistan. The China Academy of Launch Vehicle Technology (CALVT) and Pakistan Space and Upper Atmosphere Research Commission (SUPARCO) worked jointly on the satellites. The satellites will be used for geo-monitoring and to capture images from orbit. In 2016, China and Pakistan had signed an agreement to launch a special remote sensing satellite. The main reason for signing the agreement was to monitor the development of China-Pakistan Economic Corridor (CPEC) projects. Currently, three satellites are under design by SUPARCO in collaboration with different universities throughout China.